An employee of the terrible zoo dressed as the fruit bat. WICHITA, KS—Desperately hoping to raise its profile and boost attendance, the Wichita Zoo, long considered one of the crappiest zoos in the United States, is using every resource at its disposal to promote the hell out of a new fruit bat, sources reported Friday. Local residents confirmed the zoo was "doing a real big push for that bat," who was christened Dwayne following a statewide naming contest and has since become a ubiquitous presence on the backs of benches and sides of buses throughout the greater Wichita area. "We've all got Dwayne fever around here," said zoo director David Tucker, sporting a Dwayne the Fruit Bat mesh trucker cap. "Why wouldn't we? Dwayne is an amazing fruit-bat specimen, and we've built a state-of-the-art habitat for him. His family comes from Australia, he has a wingspan of 15 inches—plus, he's one of only 40 fruit bats in the state." "We're really pulling out all the stops for this guy," Tucker added. 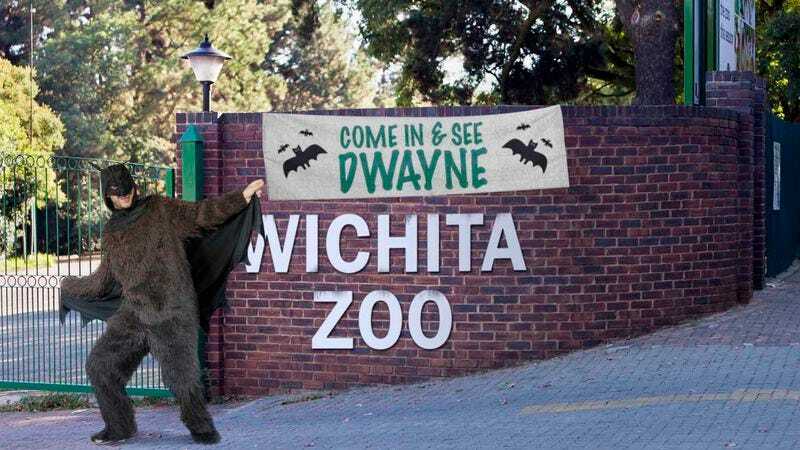 Plagued by struggles over the years to attain adequate funding, the zoo has reportedly sunk everything it can into publicizing the fruit bat, renting out billboards along major highways in Wichita and covering them with a close-up photo of Dwayne accompanied by the slogan "Get Batty Wit It." Dwayne, a common tube-nosed fruit bat, or Nyctimene albiventer, has even taken a star turn on a morning radio show. "We thought it would be great to have the guys from the V-100 Zoo Crew come out here—to a real zoo—and do a broadcast," Tucker said. "We had a skit where they interviewed Dwayne, only he sounds like Bela Lugosi doing Dracula, and he says, 'I vant to dreenk your juice!' Since that's what fruit bats drink. I did the voice myself. It's pretty comical." "We're hoping everyone will bring their family to the zoo and get batty wit it as well," Tucker added. "You can watch Dwayne for hours. He won't mind! He's as friendly as a fruit bat can be. And don't be afraid. He doesn't bite…unless you're a peach or a mango!" Tucker also showed reporters the 6-by-6-by-8-foot glass terrarium where Dwayne, on temporary loan from the San Diego Zoo, keeps company with a simulated bat colony, which zoo workers created by suspending 15 black socks from the ceiling and knotting each one at the end to create the appearance of a head. According to city officials, the fruit bat is the zoo's latest attempt to attract new patrons, shore up its finances, and avoid losing accreditation. While there was some success with 2009's Touch a Monkey campaign and last year's Bring Your Own Food for the Animals Week, attendance has steadily declined, and little at the zoo has generated much public interest since a family of raccoons took up residence in its abandoned polar bear enclosure five years ago. "I'm not really that into bats, but Dwayne was pretty cool," said fifth-grader Melinda Kepler, adding that the bat was somewhat smaller than she had expected him to be. "He didn't really move around that much. I guess you have to come at night for that." Though it closes at 5 p.m. daily, the zoo convinced a local electronics retailer to donate an old webcam that it keeps trained on the bat around the clock, allowing potential visitors to go online and view an image of Dwayne that refreshes every 30 seconds. "Who knows how long we're going to have this bat for?" said Tucker, who this month was forced to divert funds budgeted for repairing the zoo's mini-train ride in order to make payroll for his staff. "A month? Two months? All I know for sure is that Dwayne rocks, and you'd have to be 'blind as a bat' not to see that for yourself." At press time, zoo employees confirmed Dwayne the Fruit Bat had died from a combination of dehydration and muscle atrophy.